I do not recall ever starting a review writing about the art, but I simply know of no other way to talk about Marvel’s THE WONDERFUL WIZARD OF OZ. It is because the art is so striking, so tantalizing, so incredibly harmonious with the story that it redefines the way I think of the cult favorite. The movie has defined L. Frank Baum’s work for decades, searing its imagery and details into the consciousness of our culture. We think of OZ in terms of how the movie defined it, which is unfortunate if one knows the actual story. We all know that Dorothy’s slippers were supposed to be silver, but the movie has such a hold upon us that we really want the slippers to be ruby red and sparkling, don’t we? Be honest. From the get-go, I was enthralled with Skottie Young’s artistic vision for this comic. Somehow his illustrations are so in line with the tone of the original novel that I find it possible to actually separate the story from the movie and view this book in terms of it’s own authenticity. In fact, I would go so far as to say that I was anxious and ready to see the story with a new eye. It is because of Young’s art that I came to a place where I was ready to do that. Eric Shanower does his part, too, holding up his side of the bargain and he does not disappoint. His narrative takes Baum’s words and tone and allows us to hear and feel the original book. Shanower took care in this adaptation by giving us details that have – for most people anyway – been lost because of the celluloid translation. In fact, so many details were left out of the movie that many parts of this book give the reader new insight – new teeth – with which to chomp into this new-old story. From the green goggles worn in the Emerald City to Dorothy’s magic kiss, to the fact that Oz sees each of the four individually (and always in a different form), or the fact that the flying monkeys only did the Wicked Witch’s bidding because they were forced to, it is to the reader’s delight that the old story is fresh. It is like no other comic adaptation of a traditional novel and I am excited and thankful to have it in my library and make it available to my students, who have, incidentally, been waiting in line for it. It surely goes without saying that the movie version is so ingrained into American culture that nearly all children have seen it multiple times. A compare/contrast lesson between the comic and the movie would be all too easy and fun. Students could not only make text-to connections and discuss details found in both, that so many state standards could be met. Older students could also compare/contrast the original book-comic-movie versions and talk about theme and style. Did Baum’s vision remain intact in the different adaptations? Give specific examples. If you were writing your own adaptation how would you do it: book, comic, poem, movie, music video, play, musical, interpretive dance? What details would you keep in your translation and what details would you leave out? Would you change anything? What would you change and why? The enthusiastic high school teacher could even allow students to create their own version. 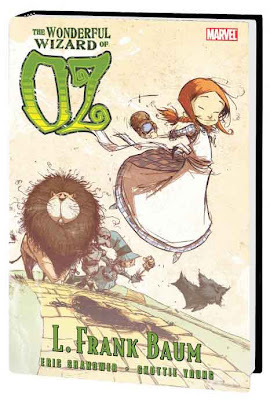 Marvel is continuing the OZ series with a comic adaptation of THE MARVELOUS LAND OF OZ. Shanower and Young will continue as the creative team bringing yet another Baum book to the 21st century reader. I couldn't agree more about the art. When the series first came out, it wasn't selling too well at my local shop, so when I picked the first couple of issues up, the owner let me have a poster of that cover--beautiful!